Are you team hotel or team Airbnb? This modern-day question can spark lively debates, as some will advocate for the advantage of a full kitchen or multiple bedrooms while others will praise the luxury of having room service and daily turndowns. This question is even more divisive in large metropolitan cities like New York, Tokyo, or Paris—where the choice of hotels and vacation rentals is abundant. And while Europeans cities like Paris are notoriously expensive, great options exist starting at under $200 a night. Would you rather stay in a charming one-bedroom in Montmartre or an Art Nouveau hotel in bustling South Pigalle? Are you the type to splurge at an iconic five-star hotel on Place Vendôme or do you prefer the luxury of multiple bedrooms and a chef’s kitchen with Eiffel Tower views? To spark your wanderlust for 2019, we lined up the best hotels and Airbnbs in Paris for every price point. Starting at under $200 a night and going all the way up to over $1,000, here is the full spectrum of spectacular accommodations in the city of lights. Which one would you choose? Opened in 2017, this 32-room hotel in the bustling South Pigalle neighborhood boasts Art Deco charm bathed in soft pastel colors. Curved velvet headboards, floral wallpapers, and colorful tile make Hotel Bienvenue a vibrant and inviting basecamp for Parisian adventures. The space is complete with a courtyard, a cocktail bar, a restaurant, and beautiful art nouveau architecture filled with tall leafy plants. Slightly further to the north from Hotel Bienvenue in the heart of the quaint perched neighborhood of Montmartre, you’ll find this newly renovated one-bedroom filled with Scandinavian-style furniture in vibrant blue and green hues. The apartment offers a kitchenette, a separate bedroom, a full bath, and a Juliet balcony from which to admire the views of Paris. One of Paris’s newest hot spots, The Hoxton stole the hearts of travelers everywhere from the moment it opened its doors. The hotel occupies an 18th-century rococo hotel particulier situated around two courtyards. The interiors are signature Hoxton: plush velvet seating, dimmed lighting, and dramatic floral wallpaper, which are all thanks to the collaborative design efforts of Soho House, designers Humbert & Poyet, and Studio Ennismore. For around the same price as a night at The Hoxton, you can also rent this striking designer’s apartment located just east of La Bastille. A former 17th-century workshop, it has been meticulously refurbished while keeping the historical charm of natural wood flooring and exposed beams—a sight for anyone who enjoys contemporary furniture mixed with traditional architecture. Paris first-timers will love being located in the heart of the action near l’Arc de Triomphe and in that respect, Hotel Vernet doesn’t disappoint. The impressive turn-of-the-century building was entirely transformed by interior designer François Champsaur in 2014, giving center stage to contemporary furniture and art under a dramatic stained-glass dôme designed by none other than Gustave Eiffel. The rooms, a little more intimate, are outfitted in the highest-quality materials and boast a striking modern style. 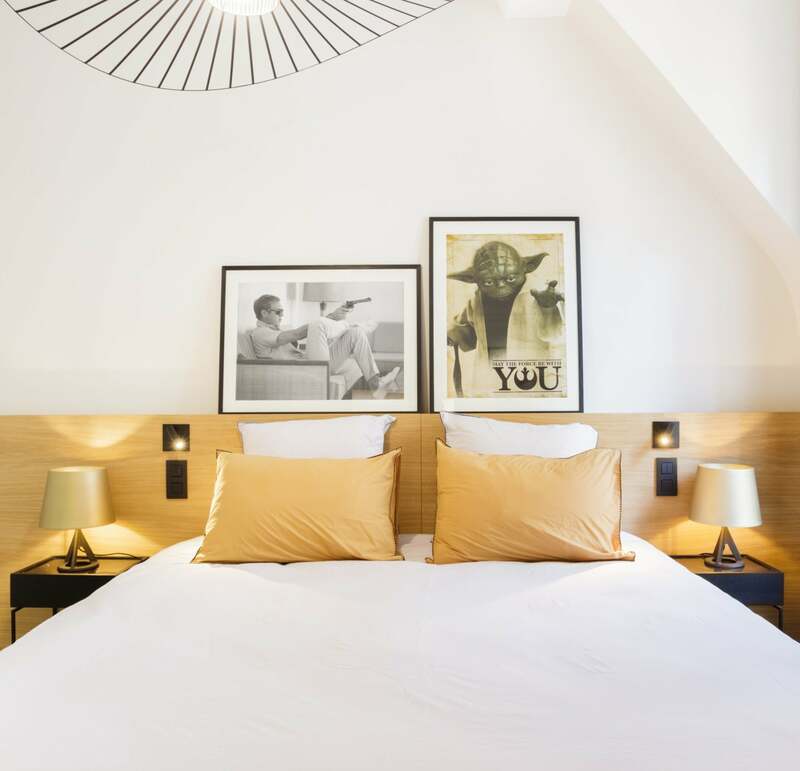 On the other side of town, an immaculate three-bedroom apartment in the heart of the Marais provides competition to Hotel Vernet—offering immaculate, stylish contemporary interiors and space in a covetable neighborhood. The three bedrooms and full kitchen give this apartment an advantage over the hotel: the opportunity to travel (and share accommodations) with a few of your closest friends. If you’re in the City of Lights to really treat yourself, there is no better place to be than the newly refurbished Ritz Paris. Reopened in 2016 after a four-year renovation (and a rumored $224 million budget), the 18th-century hotel retains its original grandeur and opulence but with a fresh, modern perspective that firmly keeps the Ritz Paris’s reputation as one of the world’s most iconic hotels. If you’re traveling in a group, you may be more comfortable staying in this comparatively priced, stunning five-story home on Paris’s left bank. Boasting terraces on each floor—all with views of the Eiffel Tower, along with two kitchens, two living rooms, a swimming pool, a gym, and an elevator, this impressive space will serve as the perfect backdrop for your French culinary adventures.